Fastener Kits are a necessity for any small to large workshop or garage. Have a variety of wood screws, machine screws, nuts, and washers accessible and available when you need them. A variety of sizes can adapt to any project big or small. 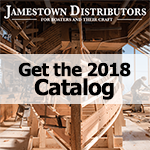 Jamestown Distributors provides a full line of fastener kits to meet the needs of the professional woodworker to the avid Do-It-Yourselfer. These kits work great around the house for any quick fixes that come up. All the fastener kits come with stainless steel fasteners. Stainless Steel is strong, durable and corrosion resistant, built to last for years. Each kit comes with a variety of screw sizes with different heads, washer and hex nut types and sizes.